I just polished my cymbals with zildjian cymbal polish and, after playing, it's leaving a black scruff on my sticks and its scuffing up my other heads. Why are my sticks getting the black? I know what you mean. Cymbal cleaner is just like any other metal cleaner or polish--the "black stuff" is the dirt and oxidization coming from the metal. This is especially pronounced on brass. There are 2 solutions that I know of. 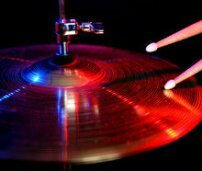 One is to continue rubbing the cymbals with a clean cloth until the black residue no longer appears on the cloth. This takes a while, especially if your cymbals were very dirty. The other solution is a bit controversial. You can use the cleaner, rub most of the black off, and then rinse the cymbals with water. Some drummers say NEVER to get cymbals wet, but I usually clean mine, rinse them good in the bathtub (use a cloth or sponge), dry them off and follow that by polishing with a micro-cloth. At this point, no black should appear on the polishing cloth. I have never noticed a reduction in sound quality from this procedure. If you want to get rid of the scuff marks on your heads, as strange as it may sound, use a little "409". Do not over-wet the heads. Hope this helps. Good luck with your drumming!